Not all of the equipment landed by Allied troops was purely military. The Caterpillar D7 Bulldozer displayed in the Memorial Museum of the Battle of Normandy is a good example. It is a machine intended for construction sites which was first of all used by the army engineering units to clear the city of Caen after the massive bombardments had reduced it to rubble. The Engineering Corps used these bulldozers to clear rubble from ruined buildings as well as to clear traffic routes or build new ones in order to facilitate the movement of troops and military vehicles. An example is Bayeux where the first ring road in France was built – the Bypass. 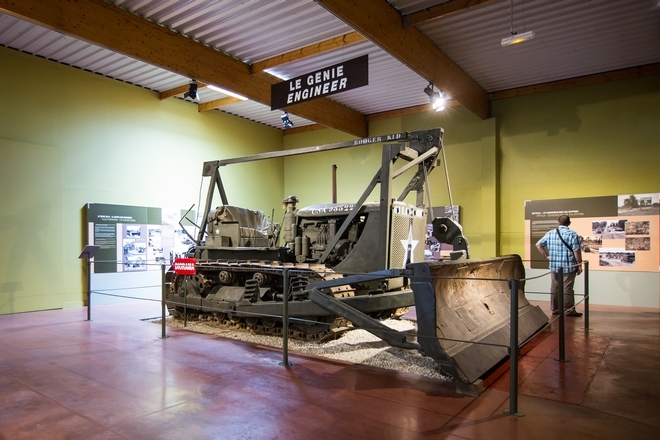 Like thousands of other worksite machines, once this bulldozer had finished its work during the Battle of Normandy it was handed over to French civilians to help with reconstruction and getting the country’s economy back on its feet.